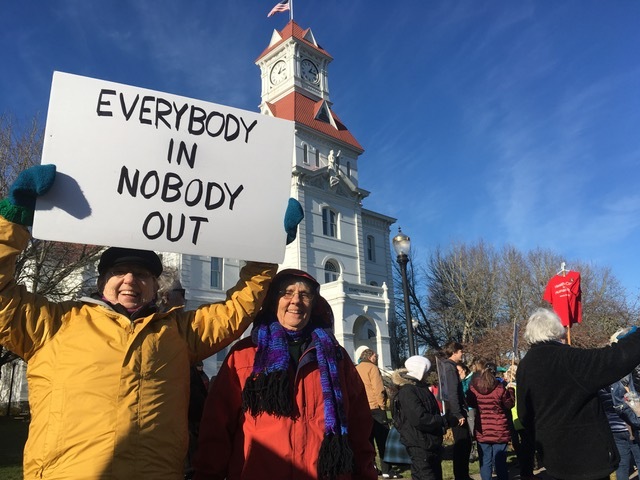 The January 15 health care rally at the Benton County Courthouse was a great success! Thank you to all who attended. Photos by Mike Huntington below. Mid Valley Healthcare Advocates invites you to join a rally on to 2 p.m. Facebook event details here. Last week members of Congress introduced a bill that if passed will strip away health care for 30 million Americans - over 80 percent of whom are working families. People already suffering will suffer more if Congress proceeds as planned. They are our neighbors, our parents and children, our coworkers, our own community. 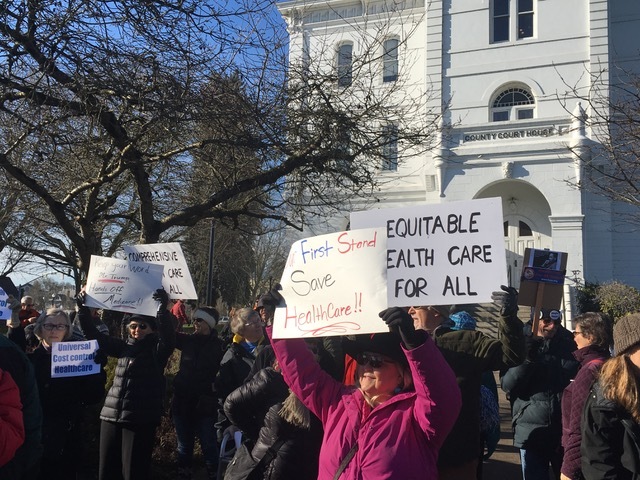 Before Congress destroys the health care of millions of people they need to show us a plan that helps ALL Americans – not one that pushes more costs onto families, strips health care from them, and rolls back important patient protections. Come rally with us! We will have signs, t-shirts, andhospital gowns for you to carry or wear. An author and chairman of the Colorado Foundation for Universal Health Care, Reid will be in Oregon this weekend touting healthcare for all. Advocates in Colorado will put a measure on the 2016 ballot. Though the Affordable Care Act, better known as Obamacare, was intended to get every American insured, the Congressional Budget Office predicts 31 million people will still be uninsured as of 2025. Reid said he thinks the way to universal coverage in the United States is through state initiatives. “Congress can’t do this. This is a proven route to universal coverage,” he said of states adopting it first. 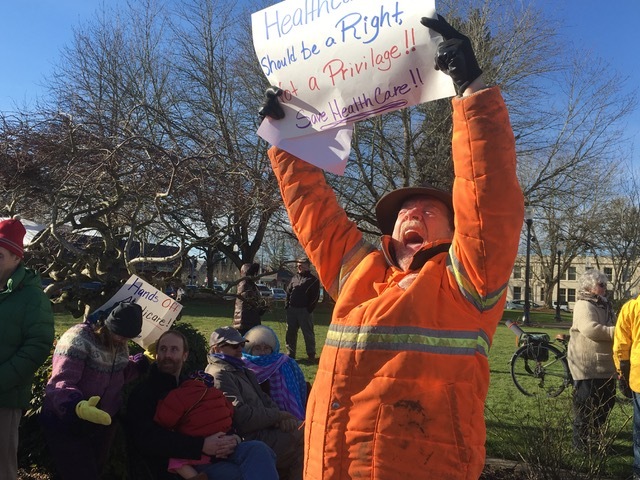 Efforts have been underway toward universal healthcare in Oregon for years and advocates say it’s gaining momentum though most universal healthcare bills that have made their way to hearings in the legislature have yet to pass. 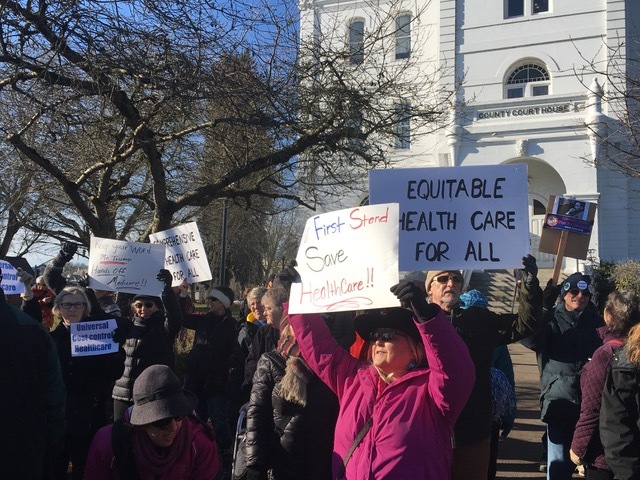 “Each time that the state single payer bill is submitted to the legislature it gets more attention, more support and it becomes more viable,” said Dr. Samuel Metz, a member of Oregon Physicians for a National Health Program. Reid thinks universal healthcare has a good shot in Colorado because of the state’s political Make up, divided evenly between Democrats and Republicans. He intends to appeal to Democrats as a way to insure everyone and save money and to Republicans as a way to get out of Obamacare. An opt out clause in the Affordable Care Act allows states to get out of the federal mandates while still receiving Medicaid dollars if they can insure people another way, Reid said. “That’s why I think we can pass it,” said Reid who expects a fight from insurance companies. He argues the private market can still offer supplemental insurance as well as private insurance for those that don’t want a state run plan similar to parents paying to send their children to private schools. The Colorado plan would add a 3.3 percent state income tax. Employers would also have to pay into the plan. Reid said studies showed Colorado families typically pay 8 percent of their salaries on healthcare. 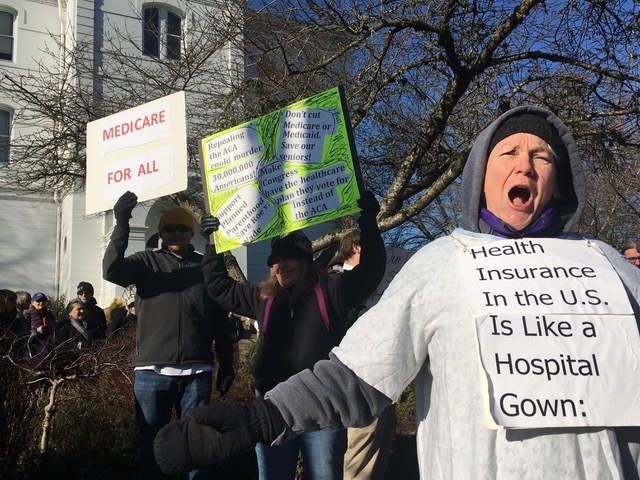 Metz thinks Oregon is uniquely poised to push forward on universal healthcare because many insurance companies are non-profit and might benefit under a universal healthcare plan. Reid said Colorado is a little more ahead of the game, with its universal healthcare study completed and a ballot measure ready to go. “We beat you to marijuana and we’ll beat you to universal healthcare,” he quipped. July 24th, Friday Noon, Collaborative Life Sciences Building, OHSU, 2730 SW Moody, South Waterfront, Portland. Open to PSU and OHSU students. July 24th, Friday 6:00 pm in Portland: Health Care for All Oregon fundraiser with Mr. Reid as the featured guest. Please contact Terry Rogers at (503) 756-4273 or ibuterry@gmail.com for more details. 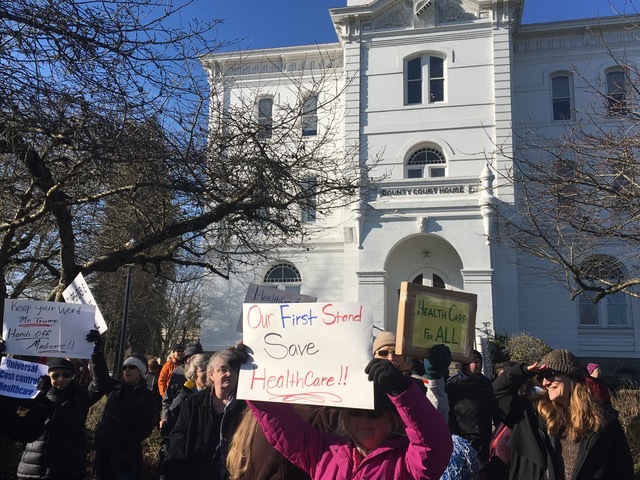 July 27th, Monday 6:00 pm at the Multnomah County Building, 501 SE Hawthorne, Portland, Board meeting room: Presentation by Mr. Reid followed by discussion: “Universal Health Care: Why Oregon Won't Be First.” No charge. Registration is encouraged (http://www.pdxcityclub.org/calendar_day.asp?date=7/27/2015&event=294). This event is hosted by the City Club of Portland, Health Care Member-Led Forum. Mr. Reid will be introduced by Mike Marshall, executive director of the Portland City Club. Just over one-quarter (25.2 percent) of adults who were insured for a full year went without needed medical care because they could not afford it. Adults with lower to middle incomes were the most likely to forgo needed medical care. Adults with high deductibles were more likely to forgo needed medical care. In 2014, half (50.6 percent) of adults had high deductibles of $1,500 or more, and 30 percent had exceedingly high deductibles of $3,000 or more. Why are people still struggling with out-of-pocket costs? Premium tax credits are tied to silver plans, which often have cost-sharing that is too high for many consumers to be able to afford. Only a portion of the lower-income consumers who are eligible for subsidies to reduce cost- sharing in silver plans receive substantial help to also reduce their deductibles. Insurers are choosing to design silver plans with upfront cost-sharing that is too high for lower- and middle-income consumers to afford. Health insurers should offer more plans at the silver level that have low or no cost-sharing for primary care, other outpatient services, and prescription drugs. Policymakers at the state and federal levels should require health insurers to sell silver plans with lower cost-sharing for primary care, other outpatient services, and prescription drugs. At the federal level, Congress should: Provide cost-sharing reduction subsidies to middle-income consumers (above 250% FPL) and increase the generosity of this help. At the state level, lawmakers can also strengthen financial assistance. Today Families USA released their report that confirms, once again, that many adults insured with high-deductible health plans are likely to forgo needed medical care, especially if they have lower to middle incomes. So what are their recommendations? In order to remove financial barriers to care, they recommend that more plans offered at the silver level - the benchmark plans - have lower or no cost-sharing for primary care, other outpatient services, and prescription drugs. This has the advantage of increasing access to primary care services, which most agree would significantly improve the performance of our health care system. The problem is that the barely affordable silver plans must have an actuarial value of 70 percent (the patient pays 30 percent of health care costs, up to a given maximum). Higher deductibles are used in most of these plans in order to meet this actuarial value. But in a report that Families USA released last year, they explain that if the deductibles and copayments were reduced to more affordable levels, then the required 30 percent of out-of-pocket costs must be shifted to more expensive services. So this scheme would help the majority who simply need primary care services, but it would make care less affordable, even catastrophic, for those who have greater health care needs. As long as our benchmark plans are set at an actuarial value of 70 percent, this trade-off cannot be avoided. Families USA also suggests the obvious. We should increase federal and/or state subsidies for both the purchase of plans and for cost sharing for low and middle income individuals and families. But if you are going to make care affordable for everyone, why continue with this highly inefficient, administratively complex system that wastes so many of our health care dollars. Surely by now Families USA should acknowledge that our dysfunctional system should be replaced by a much more efficient single payer national health program - an improved Medicare for all. We’ve experimented extensively with their preferred model, and it didn’t work. A conservative video blogger with over a million views on YouTube said this week that he would likely vote for Democratic presidential candidate Hillary Clinton because he was terrified that a Republican president would take away his affordable health insurance. 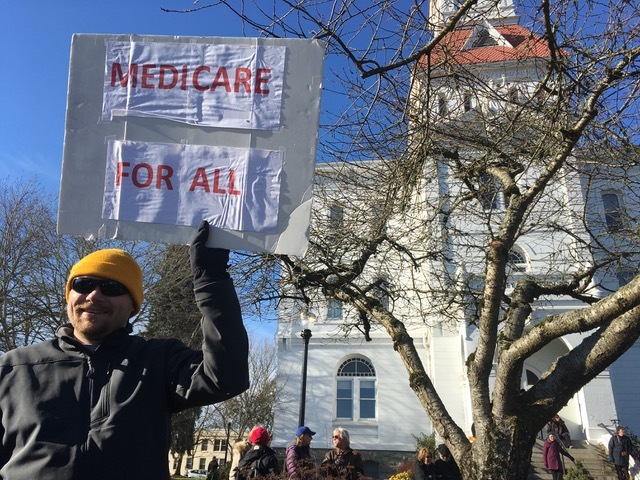 “With Obamacare, I got to retire at age 50 because if it wasn’t for Obamacare, I would have had to work until I was 65 and get on Medicare because health insurance is expensive when you’ve got medical problems,” he continued. Webb said that he hoped to lose some weight and get in shape by taking advantage of a gym membership that was covered by his health insurance. Watch the video below from the Hot Lead YouTube channel. The lesson -- once people get health care, they don't want to give it up. Publicly funded universal health care would cover more people for less money. Help us spread the word by joining MVHCA!